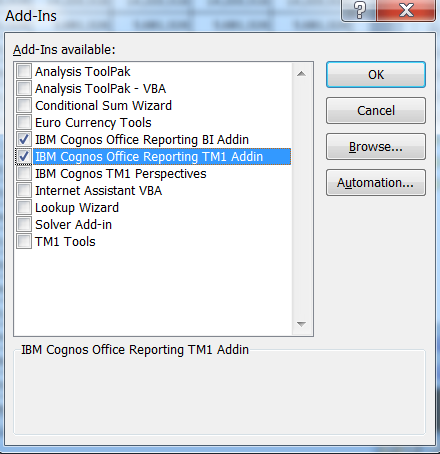 Organizations using IBM Cognos TM1 have many options for front-ends. There are a lot of good options out there, including some important new arrivals. This post discusses one of the newer front ends, Café, that has some useful new properties heretofore unavailable, most notably, the ability to utilize TM1 in Excel over a Wide Area Network (WAN.) Anyone that’s ever tried to use the Excel Perspectives add-in over the WAN will appreciate this new capability! Perspectives, TM1’s Excel add-in, is not well suited for the cloud-enabled world. Without getting too technical, Perspectives was created before the cloud and it is very ‘chatty’ with the server. Sending extra data back and forth slows things down considerably. Enter Café, one of the new TM1 interfaces. Café is engineered to work with TM1 on the cloud. A note: although the name “Perspectives” is going away in favor of Café, IBM is actually merging the capabilities of Café and Perspectives into a single add-in. This post gives an overview of the capabilities of Perspectives and Café. Perspectives is an Excel add-in, and appears in the Excel ribbon. The cube browser is Perspective’s interface for ad-hoc analysis. Users can move dimensions from rows, columns and titles as needed to see the data of interest. 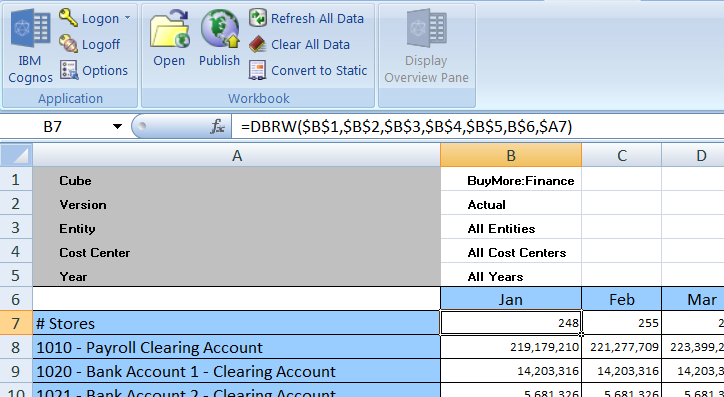 A snapshot is how you can ‘copy/paste values’ from a view into Excel. Users without TM1 are still able to see the data. Slices are similar to snapshots in that they move data from the cube view into Excel. However, slices are a live link to TM1 through their DBRW formulas. Slices are the starting point for TM1web based reports. DBRW formulas are a problem in the cloud environment. DBRW formulas are ‘chatty’ and when they connect to a TM1 server that is geographically distant, there will be a lag in performance. Café is also an Excel add-in. 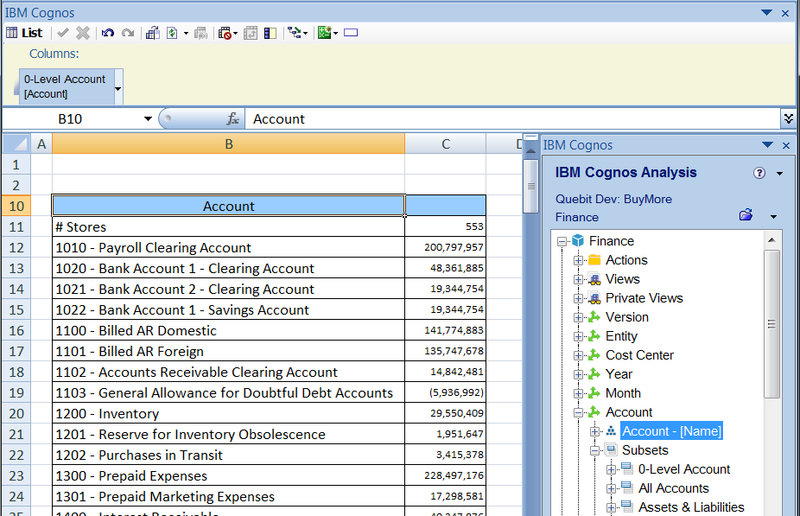 The ribbon tab reads IBM Cognos. Lists are new in TM1. They don’t exist in Perspectives. Lists are one dimensional lists of elements that appear in Excel. The image below shows a new List containing the 0-Level Account subset of the Account dimension. Note that data appears in the list. Café will implicitly accept the default element of every dimension and retrieve those data points. Crosstabs are the equivalent of the cube browser in Perspectives. You can drag and drop dimensions to the row, column and context area to change the view. Note that you can only have one Crosstab per Excel worksheet. Flex Views are the equivalent of slices and snapshots in Perspectives. Flex Views differ from Crosstabs in that a Flex View’s structure is more rigid. You cannot change the number of dimensions on the columns and/or rows. Note how cell B8 contains a value, not a DBRW formula. Flex Views use a new technology to retrieve data from the TM1 server. A Flex View looks like a snapshot because a value appears in the cell but a Flex View behaves as a slice because that cell is still a live link to the TM1 server, no DBRW formulas needed. You can have multiple Flex Views on a single Excel worksheet. Formula views are slices in Café. Café is the new TM1 Excel based interface that will eventually replace Perspectives. All the previous features are still there; they just look a bit different. Performance is greatly improved with Café. Traditional DBRW’s could take minutes to refresh when connecting to a remote TM1 server, with Café a similar report will refresh in seconds. Café 10.2.2 FP6 is compatible with Office 2016 and earlier versions of Excel. Unfortunately, Perspectives and Café cannot be used simultaneously. All of your existing TM1 reports should still work in Café. However, we have seen intermittent problems with Active Forms. Schedule appropriate time to test ad migrate your reports prior to rollout. If you are looking to get your users started with CAFÉ, you can register them for an online, self-paced course by clicking here. You can save 20% off by entering the code, Online20%Off, during registration.